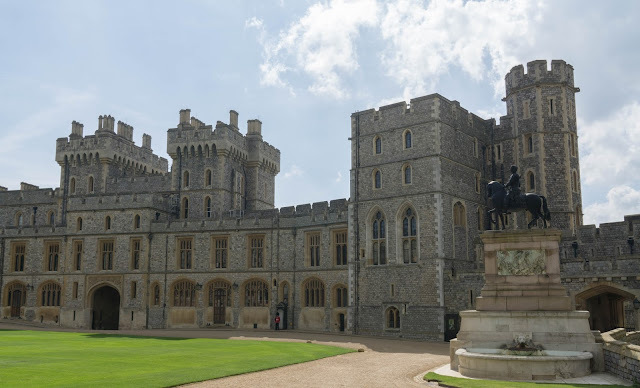 Random Thoughts and Musings: London Vacacay, Outing 3: Windsor Castle and St. John's! 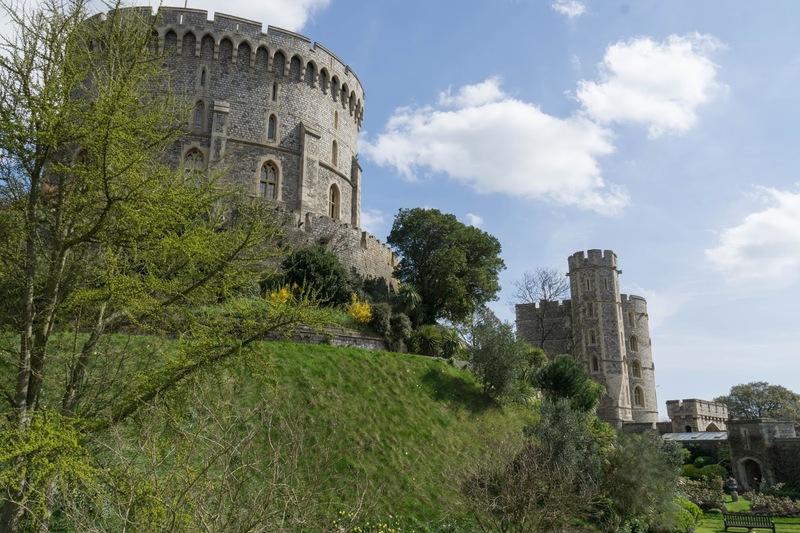 London Vacacay, Outing 3: Windsor Castle and St. John's! Our third outing was to Windsor Castle, the furthest we traveled on the trip. We could have punted our way up the Thames (not really, but that's what they used to do), but instead took a train ride. I haven't talked about the train system in London, and it's worth more than a mention. Tell you what -- I'll do that in a separate post. I don't want to keep you waiting on this venue, because it is almost beyond belief. 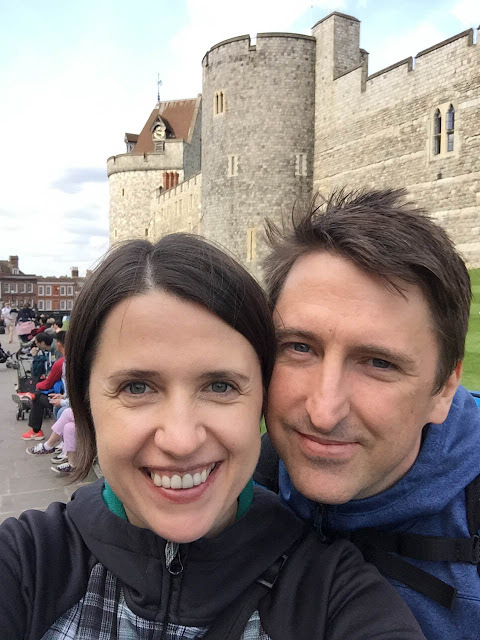 Getting off the train, we walked briskly up from the station straight to the castle. There was a slight crowd gathered, and ushers ushing people around. We were trying to stay out of the way while figuring out what was going on. As it turns out, luck was on our side. 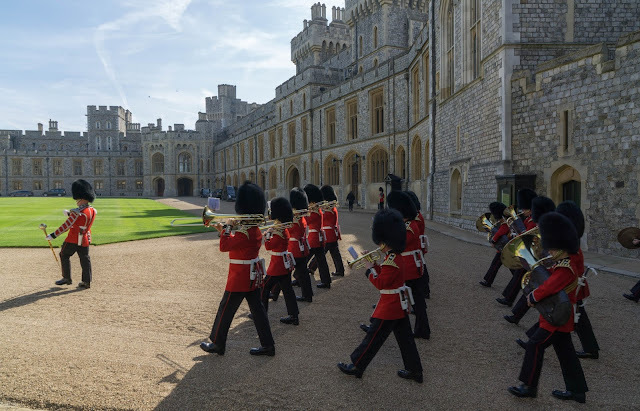 We had arrived just before the once-daily formal changing of the guard ceremony. Most of the spots along the wall and gate were taken already. We were slightly disheartened, then saw a particularly British-looking usher standing near an arch leading to another area. Motioning to him in as questioning a manner as I could, he smiled at me while maintaining a stiff upper lip and waved us over. He showed us a spot around the other side of the Quadrangle that was ideal for watching the ceremony as well as listening to the band as it marched in and out. The Queen might be in that far window! 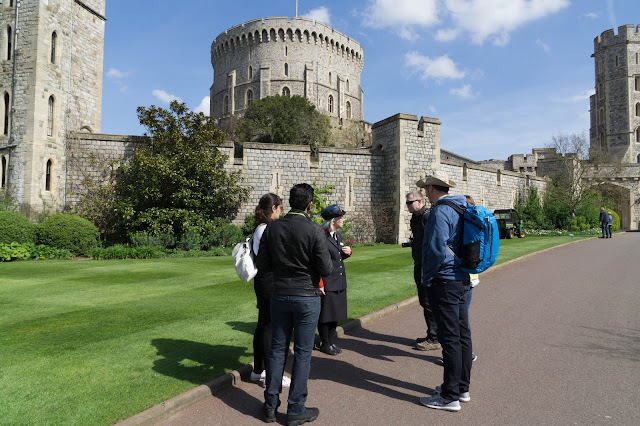 As an aside, the Quadrangle is where all of the tournament games would have taken place in medieval times, and is where heads of state and other dignitaries meet the Queen when they visit, coming up the Long Walk on the south side of the castle. 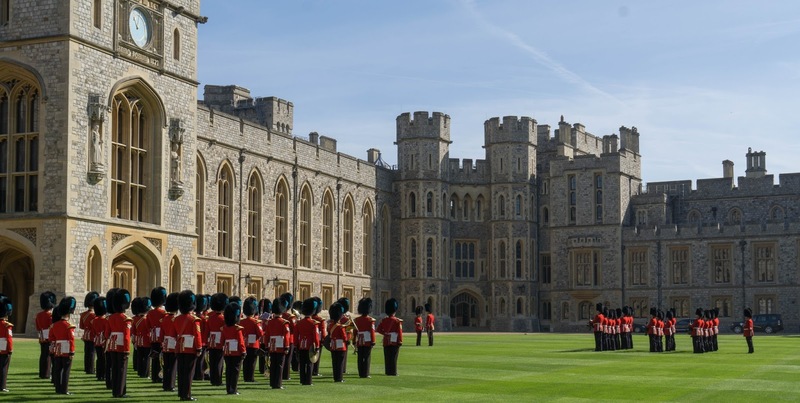 And yes, the Queen was in residence the day we were there, although we didn't see her. The formal ceremony takes the better part of an hour. 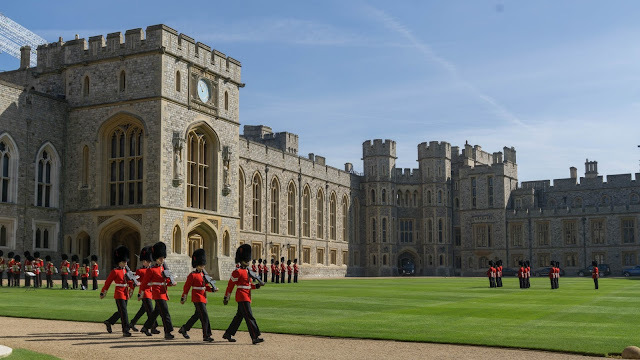 The old guard stands at attention on the north side of the Quadrangle while the new guard marches onto the south side. The leaders meet near the center, yell at each other, yell at their guards, then partially exchange places. The band plays at least three tunes in between all of the ceremony. Finally, the old guard and new guard have completely switched places, the band marches out, and the old guard marches out. There are LOTS of little details that are probably worth noting, but I'll mention two quickly. First of all, the band plays, but I found myself being the only person applauding. The very British usher actually thanked me for it, as the band appreciates it and it doesn't happen very often. I asked why that was, and he said "I think everyone thinks this is a church," then shrugged a bit as if to say "it's the British way." 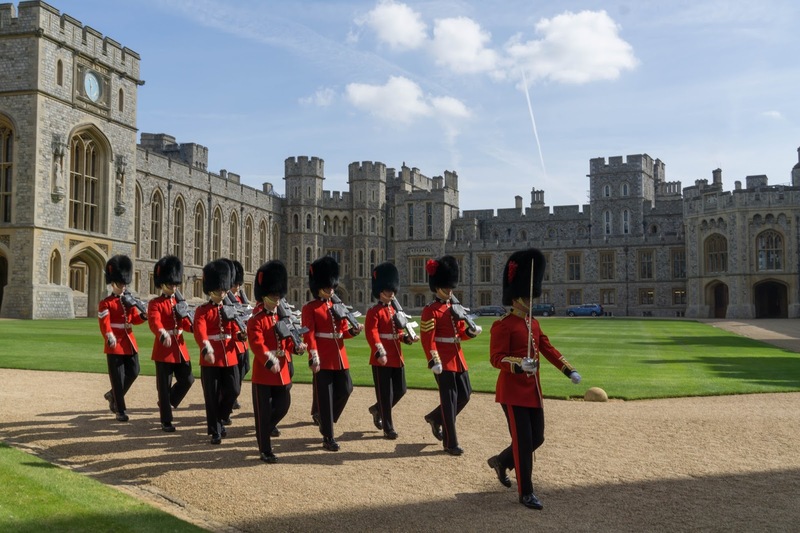 The other detail is that the guards' uniforms are slightly different. For example, a few of them were wearing pointy shoes instead of rounded toes. I asked the same usher about it, and he said it had to do with rank. Apparently, when you're important enough, you get pointy shoes. After the changing of the guard, we made our way back toward the lower ward and decided to take the Precincts Tour. 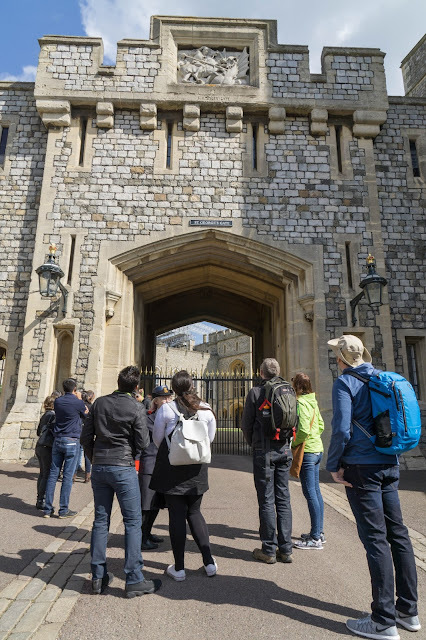 Given the grandness of the castle, the tour is amazingly short -- 30 minutes at the most. We were privileged to be guided around by a lady that fit the castle's ambience perfectly. She was 5'2, with more gray hair than white, an easy smile, dignified manner, and had been working at the castle for ten years. You there! Pay attention, or I'll lock you in the Round Tower! We toured around through parts of the Lower Ward, up to St. George's Gate, back around through the Norman Gate, and ended on the Northern Terrace, where many kings and queens have enjoyed taking their constitutionals (the walking kind). The amount of history wrapped up in that 30 minutes was staggering, and humanizing in some ways. 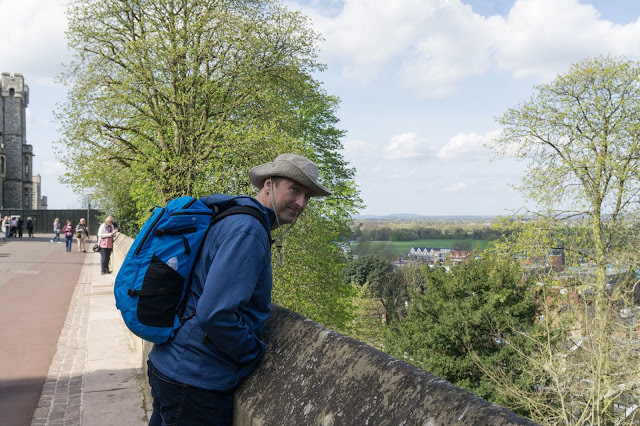 It was true that we were walking in the same ways as kings and queens, and were looking out on vistas that have changed over time, but at the end of it all, these monumental people were just human, and not fundamentally different from any of the rest of us, despite their rank. St. George slays a dragon, and all he gets is a crummy gate. Did the Queen lean out over this very spot earlier today? The rest of our time was spent exploring the State Apartments and the Doll's House area. Here is where personal photography had to end. No photographs of any kind are allowed inside. The reasoning is that the Queen owns the copyright to everything, flash photography hurts everything, etc. It was frustrating, because we weren't using flash photography and weren't trying to violate any copyright laws, but I understood where they were coming from. Luckily, images exist on the Internet already, and the samples we found were remarkably like what we saw. You can get a sense from the above about the grandeur that is exhibited in each State Apartment. Pictured is St. George's Hall, with the family seals of the Order of the Garter adorning the ceiling and walls. Some of the seals are covered, meaning that that knight had somehow dishonored himself (most likely by doing something that pissed off the King). I can't remember exactly how many State Apartments there are in total, or how many we actually went through (the number seems to be between 30 and 40). Regardless, every one of them had art in the form of paintings and sculpture, including the furniture itself. Various rooms in green and red and blue and gold, and everywhere you look, something historically significant or noteworthy. Dizzyingly awesome! After making our way through the State Apartments, we went up to see Queen Mary's Doll's House. You thought your Barbie Dream House was pretty fancy when you were young, with that fully operational (via string) elevator? Well, that's PEANUTS to this doll's house. The structure itself is about three feet tall, but the outer walls lift vertically to reveal the inside. Everything inside the doll's house is a faithful reproduction of a real-world object, INCLUDING operation. That's right -- this thing has running water and working electricity (and gas!). So, we went from life-sized majesty to majesty in 1/12th scale. The key here is to go to the Doll's House when there's no line (queue, in British English). 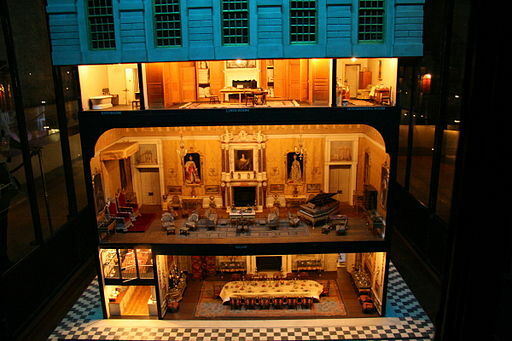 The room itself is small, dominated by the doll's house at the center. You walk around the house clockwise, and then exit. It is not a long trip, and with the pressure of many people behind you, you might not think it's worth it, or might not want to linger at spots. 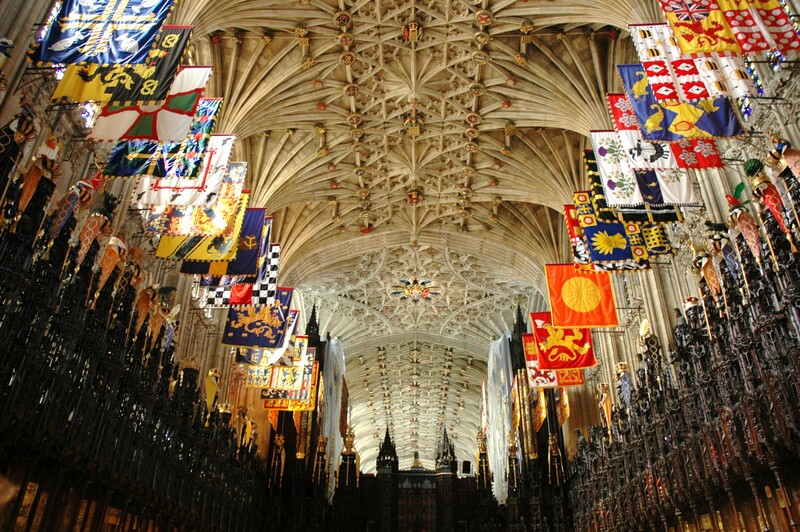 The last spot we visited was St. George's Chapel, which is the church in Windsor Castle. You can see more family seals of Knights and Ladies of the Garter. These seats are reserved for members of those families. Both ends of the chapel have large stained glass windows depicting various saints and figures, but one of the figure's faces has faded, as if it were too exposed to the elements, or subject to some undue stress. The verger couldn't tell me when or why that had happened... Smells like a mystery to be solved! I'll add a couple more photos we took of the castle. None of them do the actual venue justice. If you ever make it to London, you HAVE to go visit it. After a late lunch in Windsor, we caught the train back to London. We had a reservation that night at a one-Michelin-star restaurant named St. JOHN, and didn't want to be late. The restaurant's exterior is modest, and the inside is what you would expect given the entry. What makes this a one-Michelin-star restaurant is the chef's approach to preparation -- nothing is wasted. Our appetizer was bone marrow on toast, which is one of St. JOHN's signature dishes. It was definitely everything it was cracked up to be. See what I did there? You used to have to crack the bones to eat the marrow... Gah, nevermind. There were two issues with our experience at St. JOHN's. First of all, the main dining room has a fairly high ceiling and no noise dampening. As a result, it was VERY loud. There was a corporate gathering there while we ate, and Tanya and I almost had to shout at each other across the table to be heard. The second issue was that the portions were very large. Yes, you read that right -- I just said the portions being large were a problem for me. No, I'm not sick, and yes, I'm still Rusty and not an alien body snatcher. 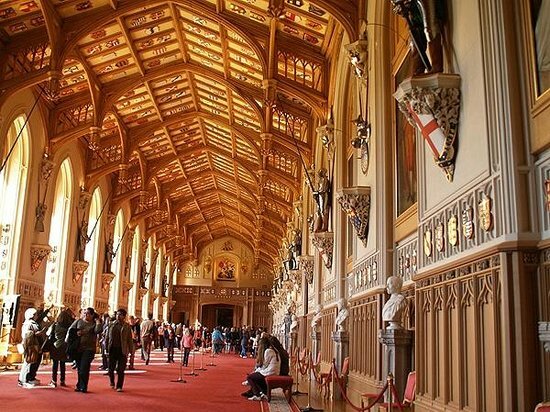 We had a late lunch in Windsor and an early reservation at St. JOHN's. However, given the Michelin star rating, we figured the portions would be conservative at best. We were wrong, and probably should have read the reviews more carefully. This wrapped up our third outing. Next comes St. Paul's Cathedral and the Tate Modern! I'll try to get it written up more quickly, promise!